W. Stewart Agras M.D., "The Oxford Handbook of Eating Disorders"
A rich source of authoritative content that supports reading and study in the field, The Oxford Handbook of Eating Disorders reviews current research and clinical developments through synthetic chapters written by experts from various fields of study and clinical backgrounds. 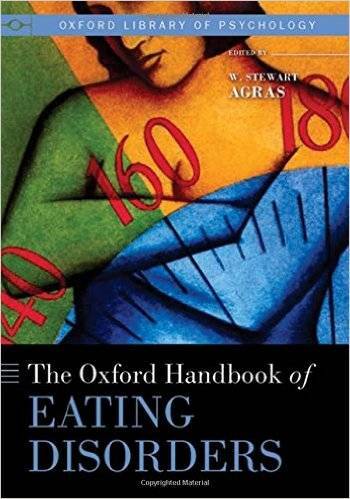 Epidemiologic studies suggest that eating disorders are not only common but have increased in prevalence in recent decades, and this handbook refines and updates the state of research. The book is divided into four sections: phenomenology and epidemiology of the eating disorders, approaches to understanding the disorders, assessment and comorbidities of the disorders, and prevention and treatment. The first section deals with classification and epidemiology of the disorders, considerations for revisions to the Diagnostic and Statistical Manual of Mental Disorders, and the somewhat neglected topic of eating disorders in childhood and early adolescence. The second section describes research basic to understanding the eating disorders and addresses biological factors, psychosocial risk factors, cultural factors, and the effects of behaviors such as dieting and eating and weight concerns in the genesis of the eating disorders. The third section describes assessment of the eating disorders, medical and psychological comorbidities, and medical management. The final section deals with various treatment modalities that have been found successful, including psychotherapeutic and psychopharmacologic approaches; an overview of evidence-based treatment for the eating disorders; and a consideration of what we know about cost-effectiveness of existing treatments. The multiple perspectives and breadth of scope offered by The Oxford Handbook of Eating Disorders make it an invaluable resource for clinicians, researchers, and educators, as well as scholars and students.